In an exclusive reveal by the team at Summer Island Maldives and Alex Goad of Reef Design Lab, The Edition explores how 3D technology may bring ‘summers’ of hope to coral reefs in the Maldives, drowning amidst seas of neglect. Apart from the glaringly white ceramic exterior, the 3D printed ‘artificial reef’ that was submerged 7 metres underwater at Summer Island Maldives just a couple days ago, is barely distinguishable from a natural ‘giri’ (small coral reef) formation. Yet the goal is far from wanting to replicate the aesthetics of a reef, and more along the lines of developing solutions that do not mitigate coral growth while contributing to the marine environment in a positive way. With a little luck, the structure, already home to a lionfish and moray eel, will soon welcome the growth of numerous coral colonies, schools of dramatic reef fish and a whole array of other fascinating critters. In layman's terms, 3D printing technology helps mimic a reef’s natural contours, helping corals to attach and grow better. The technology also allows designers to research concepts such as whether there is a suitable geometrical shape for maximising the colonization of corals and marine life, sparking awareness and important discourse on how to better address various environmental issues related to urban development and more. 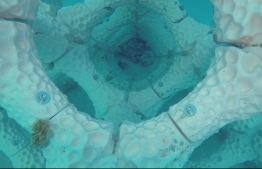 Using ceramic material, as well as a structural model created by Alex Goad, an industrial designer from Australia, the resort has hopes that this experimental coral transplanting method might be used more easily and affordably - giving the survival of the coral reefs a fighting chance. Even right here in the Maldives, where each island rests atop a ring-shaped coral reef that makes up an atoll, many fail to realise that every piece of coral is not a particularly intricate stone, but a colony of living animals called ‘polyps’ that breathe, eat, and reproduce. What's more, coral reefs form an integral part of an island’s ecosystem. Simply put, without coral reefs, we cease to exist. That doesn’t just apply to Maldivians, it is true of all humans. Afterall, up to 85 percent of the oxygen we breathe comes from the ocean, and a healthy ocean depends on healthy reefs. Yet right this moment, coral reefs around the world, and in the Maldives, are rapidly dying. Scientists calculate that, if things continue as is, by 2030 nearly three-quarters of all reefs will likely be damaged or destroyed. Underwater enthusiast or not, this is cause for concern as natural wave barriers to islands, entire diving and fishing industries, fish and other seafood, all cease to exist if corals die out. Oh, and breathable air, as well. To add to the dilemma, the very same coral reefs destroyed in seconds by a rough hand, or bleached away by a season of warmth, can take millions and millions of years to reach the kind of growth we are used to seeing immortalised in vivid photographic depictions. These are just a couple of reasons why the work being done by the wonderful people at Summer Island Maldives is so incredibly important. Alex is the founder and creative director of Reef Design Lab, a non-profit design studio and think-tank based in Melbourne, Australia, that specializes in providing innovative new eco-engineering products for clients wishing to increase the ecological value of their rock walls, jetties, marinas and canal estates. He is also the mastermind behind a highly acclaimed ‘modular artificial reef structure’ he fondly refers to as simply ‘MARS’. 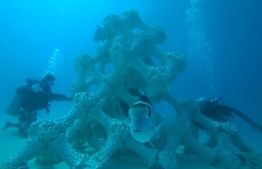 That said, hosting the world’s largest artificial reef using Alex’s designs is only the most recent of the resort’s marine-themed accomplishments. Although Summer Island Resort's artificial reef now spans an impressive 100 square metres, it can be traced back to fairly humble beginnings in 2016, when Arjan Sierink, Base Leader at Diverland Diving Centre, first decided to grow corals at the island. Propagating coral involves breaking off small fragments of living coral, to grow new coral colonies, much like gardeners growing entire plants, from small shoots or branches. 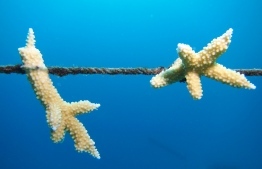 After extending the reef using limestone and cement structures to propagate different species of coral, Arjan, an engineer by training, continued his experimentation by creating frames and stringing pieces of coral that are hung freely and left to grow. This led to the idea of growing coral colonies on structurally similar PVC pipes to test whether the method would be viable at Summer Island’s own ‘Blue Lagoon' - a sandy part of the lagoon found best suited for creating their artificial coral reef ecosystem. 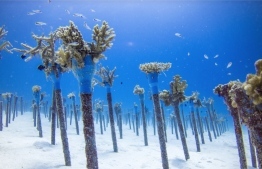 After acquiring approximately 16 test pipes, the team ventured forth and created a nursery that is now home to 514 healthy, thriving coral colonies that prides itself on a survival rate of 95 percent. All the way to MARS! 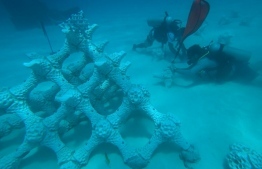 After much discussion and analysis on the research Alex had done internationally, along with Summer Island’s own data, the team finally came up with a plan to cast moulds in ceramic – an inert substance, similar to the calcium carbonate found in coral reefs, that would be assembled on the island. “The beauty of this system is that you don’t require any large-scale cranes or barges to implement the system. 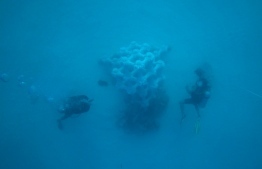 It can really be built by people underwater," Alex said, explaining that it can also be built according to one’s criteria for coral transplanting, as a small long system or as high columns. 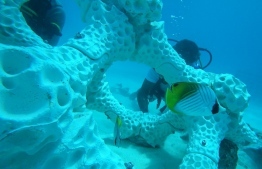 After what seemed to be a rather gruelling 24-hour wait for the 3D printer to complete printing detailed moulds of the reef structures, the ceramic moulds finally made their way to the Maldives, where they were filled with marine concrete. Then, on the 12th of August, 220 ceramic, concrete filled moulds were slotted together underwater, like a massive LEGO set, creating a new artificial reef. “One of the most surprising discoveries we made, turned out to be how simple it was to assemble these structures underwater, so if the experiment proves to be successful, it would make it that much easier to implement in larger applications," said Alex. Today, fragments of coral from the nursery continue to be transplanted onto the 3D reef, where hopes are that they will grow and colonise the structure. Borne out of what he dubs “a human obsession to build and create”, Alex expressed his eagerness to explore the realms of possibility between industrial design, biomimicry and what that could mean for the future of sustainable development. The most amazing part of the story would be, however, if the 3D printing technology does prove more successful at growing corals than limestone, frames, coral ropes, coral pops or any other method, potentially becoming a more efficient way of helping coral reefs survive Earth’s ever-warming climate. “It is just so awesome and so inspiring, to see our work come to life,” said a jubilant Mari, the Resort Manager at Summer Island Maldives. “As we worked together, we learnt more. As we learnt more, we became more and more awestruck by the amazing work that we were getting to be a part of,“ she said. “We really want to foster a culture of innovation in this country. There are a lot of young people who have been watching this project, are really excited by it and want to start doing their own things as well," added Alex. Mari echoed his sentiment, adding this was just one part of an island-wide initiative to start doing more environmentally friendly activities. “From my perspective, it's not only from the guests but also for the staff, and it's amazing to see how they are learning and they are interested and they are willing to do things now,” Mari said, as a hopeful grin spread across her face. For now, the future of corals and reefs in the Maldives, as well as Summer Island’s artificial reef project remains unclear, albeit filled with hope. However, with one ‘turquoise' thumb on their ‘marine garden’ and an unwavering passion for their work, the resort seems well on their way towards a positive outcome.